Made from pure .925 sterling silver, the Christian Ichthus Fish Chastity Ring from Apples of Gold Jewelry is both stylish and meaningful. The ichthus ring measures 9mm wide and is available in women's whole sizes 4-8. The ring weighs approx. 2.44 grams of sterling silver. Early Christians would use the Ichthus fish symbol as they were being persecuted by the world. One Christian would draw half of the symbol and the other Christian brother or sister would draw the other half in order to identify themselves as Christians. This is a powerful and meaningful historic symbol. 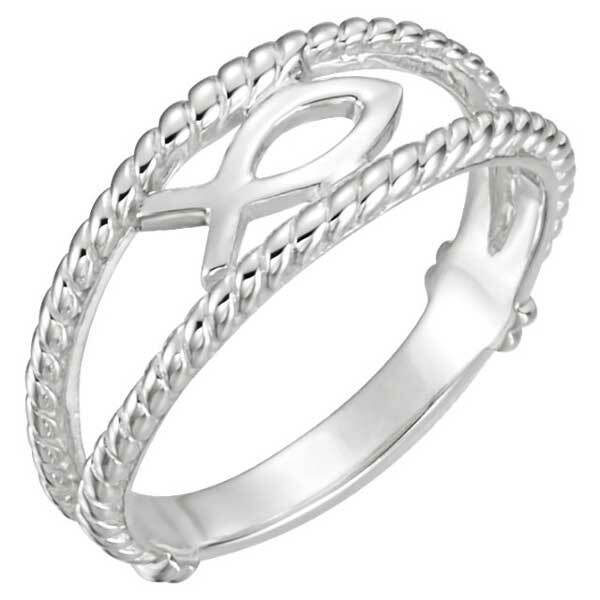 The Ichthus chastity ring is also available in 14k yellow or white gold, shown below. We guarantee our Sterling Silver Christian Ichthus Fish Chastity Ring to be high quality, authentic jewelry, as described above.